â€ This LCD handwriting board is good replacement of paper sticker, sketch book and whiteboard, it can be used for memorizing, message, to-do list, shopping list, calligraphy, painting, arithmetic, game, scoring and mathematical verification, etc. â€ Adopts flexible liquid crystal display technology with low power consumption. Large view angle makes you can see the handwriting clearly. â€ High-quality materials that are not only durable but also lightweight enough to let you take this writing tablet wherever you want. â€ The high precision and sensitivity performance provide smooth and clear writing just like on paper, you can write with included pen, or with your fingertips. â€ You can easily remove the handwriting by simply pressing the cancel button. You can use at least 100,000 times to save 100,000 pieces of paper. â€ The shell is made of liquid crystal panel, which is made of wear-resistant, fall resistant and non-toxic plastic. 1. Using temperature should be between 0 and 40 degrees. 2. Avoid the product from water or soaking in water. 3. Avoid using sharp objects to scrape the screen. 4. Please use dust-free cloth to wipe when cleaning. 5. Replace appropriate battery, CR2025 button battery. Eco-Friendly Writing: No waste paper anymore! Now write anything on the LCD writing tablet instead of on papers to save resources and protect environment. Best paper saver, can be used repeatedly up to 100,000 times! Easy and Funny Doodle: The writing is smooth and clear, just like writing on the real paper, suitable for ordinary writing, painting, doodle, design, ideas recording. Also can draw with your fingertip. One button erasable, easy to wipe off for next using. Low Consumption: Powered by a CR2025 button battery, low power consumption, the principle of writing is by pressure. One button can be used for 1-2 years. Save money and energy. Ultra Lightweight: Super thin and lightweight give you comfortable hand feeling when writing. Only 0.1inch thichness and about 140g weight, portable to carry with your backpack, file bag anywhere. 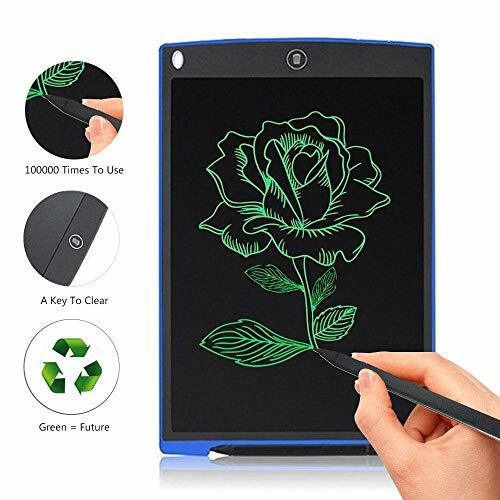 Good Gift For Everyone: This LCD writing tablet is really a good gift idea for kids, children, students even adults in school and office, perfect writing board to replace traditional paper writing! If you have any questions about this product by Teepao, contact us by completing and submitting the form below. If you are looking for a specif part number, please include it with your message.